These are the words uttered by President Donald Trump in his first address to Congress on February 28th. It seems scary. It suggests that there is a huge problem in America, where crime is out of control, and where “carnage” rules the day. Here is the problem. It isn’t true. Yes, the Uniform Crime Reports recorded 15,696 homicides in 2015, an increase of 1532 or 10 percent over 2014. But the claim offered by the president leaves out the fact that the homicide rate in the United States has been falling consistently since 1992. The claim by the president is manipulative, it takes a one year increase, and makes it sound like there is something sinister going on. But he did say murder “rate,” so let’s look at the actual homicide rate (calculated as the number of homicides per 100,000 Americans). Here the change does not seem so dramatic. The homicide rate in 2014 was 4.44 per every 100,000 Americans, and increased to 4.88 in 2015. Yet this is rate is less than half of what it was in 1991, when the homicide rate was 9.79 per 100,000 people. There were roughly 250 million Americans in 1991, whereas in 2015 the population increased to more than 320 million. Homicide Rates, US, using FBI UCR Data. The claim that it is the largest single-year increase in nearly half a century is also factually inaccurate. It is a lie. 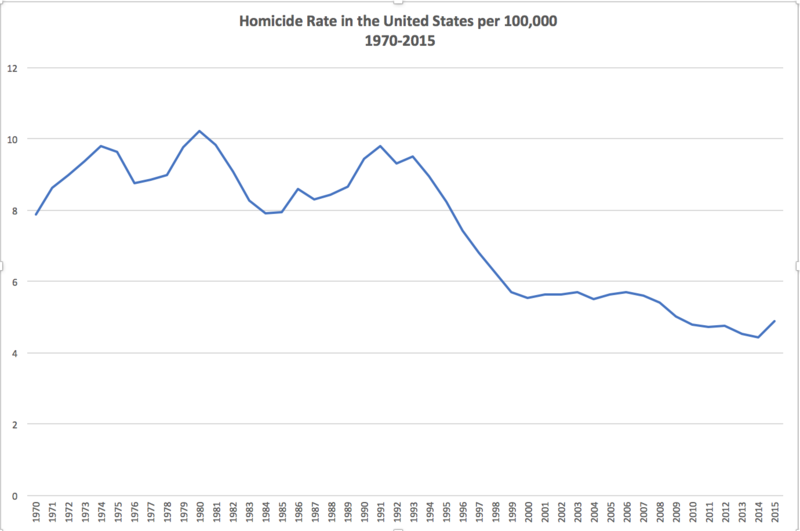 There have been several increases in the past half-century when the raw number of homicides increased by more than 1532, and the murder rate increased by more than 0.442.. In 1990, it increased by 1940 homicides (increase of .763) over 1989. In 1986, it increased by 1633 homicides (increase of .633) over 1985. In 1980, it increased by 1580 homicides (increase of .473) over 1979. In 1979 it increased by 1900 homicides (increase of .780) over 1978. In each of these examples, the homicide RATE was more than double what it is today. 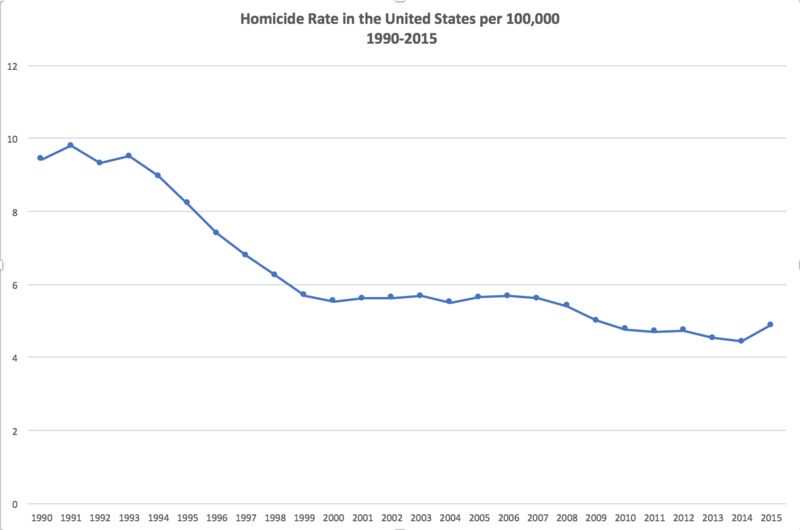 Moreover, there have been several years since 1992, where there have been increases in homicides over the prior year, such as an increase of 592 in 2005, but the over-all trend has been a large decline. If we look at the data from 1990 to 2015, we can see that the increase in 2015 is relatively minor, and if anything, appears as if 2013 and 2014 were somewhat lower than the rate from 2010 – 2012. The president’s statement is a lie. It is manipulative, and it is intended to fit his narrative of law and order. This is no surprise for Donald Trump. He has routinely made false claims, and then repeated them so many times that people begin to believe they are true. By taking a small blip in a 25 year period of almost continual declines in crime, the president is trying to make it appear that the nation is facing lawlessness in the streets. He can use this to try to counter the numerous public complaints against abusive behavior by law enforcement that have been at the forefront of American politics since 2014. Don’t fall for the lie. Don’t let him gaslight you into questioning reality.